you at least consider natural childbirth, or you take a class like hypnobirthing or the Bradley method, or you have a midwife or a doula, or give birth in a birthing center. I know a few moms who gave birth at home, and it was suggested to me that I give birth at home for my next child, because Zoe was born relatively quickly. Perhaps I am alone in this, but I love hospitals and trust doctors. Of course I want to have a voice in my medical care, but I also prefer to leave things that I was not trained in to medical experts who were. And I prefer to take medication when there is significant pain on the horizon. But perhaps that’s just me. I could go on, but I won’t. All this is to say that I have a lot of respect for people who are more healthy and natural than I am. But I’m not really that crunchy granola. And while part of me wants to do better, I need to be realistic. A few years ago when my husband and I had organic vegetables delivered from a local farm twice a month, we never finished them all. We let stuff rot and felt guilty. When they deliver kale or beets or whatever else it was and you’re supposed to branch out and try new things and learn to cook kale or beets or whatever, I just don’t want to. Is that ok? Or, why I love Facebook. Tonight I went to see The Real Jane Martin, a Chicago-based band whose frontman Allen Rein is a friend of mine from college. They were playing at St. Elmo’s, a little coffee shop where I sometimes go during the day with laptop in tow to work. I downloaded TRJM’s cd Simple Math when I heard about it from Allen on Facebook a few months ago. I love music and love new music and love the chance to support someone I know doing something they love, so I bought it without even listening first. And it’s great. And now that I’ve heard Allen (and his excellent musical other half, Mark Burns) live I will enjoy the music even more. That’s always what happens. I used to be a groupie. I used to hear live music ALL THE TIME. I saw Eddie from Ohio (of whom I was a groupie) more times than I can count, mostly at Bad Habits, a divey venue where the only safe thing on the menu was the grilled cheese sandwich. I had bootleg tapes and cds of Eddie from Ohio, and lively debates with friends about which band member we thought would be the best kisser. I was once asked out by someone selling merchandise for the band, and went on one of the worst dates of my life, during which the guy professed that he preferred women with red hair who wear Laura Ashley sundresses. I also saw a lot of EFO shows with a former boyfriend, who was also a groupie, perhaps more intensely than I was. He was also a big fan of live music in general, and that was an era when I went to a lot of shows. I’ve seen the Indigo Girls many times, with many different groups of friends and once with my husband. I’ve seen HEM several times, all with my husband. HEM was one of the groups that brought us together, since we both thought no one else had ever heard of them when we met. Mostly I’ve gone to rock shows and folk shows. I’ve spent many evenings at the Birchmere (another great music venue with awful food) with all kinds of company. But most of these musical outings were pre-Zoe. Sure, we have gone out plenty since Zoe was born. We’re not afraid of babysitters and we have two sets of local grandparents and several grown-up childless friends willing to hang out with Zoe. But we are also busy people with a lot of stuff going on, so we have to choose our date nights very carefully. We have gone to concerts, usually planned and tickets purchased months in advance. And it’s always fun. But there’s something different about just going to see a band, at a coffee shop, where someone you know is singing and playing lead guitar. Tonight I was sitting in a chair a few feet from Allen, wiggling to the music and watching people walk by outside. I encountered another college friend (Allen’s college roommate) who I hadn’t seen in years. I was joined by a new friend whose daughter goes to preschool with Zoe. And I met new friends, a couple whose kids also go to our preschool, the husband of which I was just asked to co-chair a committee with this week. I had just googled him and it turns out he’s friends with Allen. That’s why I love Facebook. It proves that it really is a small world and you always find someone who has a connection to someone else surprising and you learn something interesting about your friends and acquaintances and random people you end up friending. But back to the point, it was so enlivening and fun to see a band, be out on my own on a weeknight, not have to rush home to relieve a babysitter (Randy hung out with Zoe tonight and apparently they were making up their own songs and cracking up all night), to socialize and hear music and be a person in the world. It gives me a little more energy, and a song in my step. I suppose it had to happen eventually. Naively, I hoped that it never would. Does every mom secretly hope that her child will magically be the exception to every childhood trial and tribulation? Obviously, I do. But it is official. Zoe has tantrums. Thankfully (so far) they are not the 20-minute-lying-on-the-ground-kicking-and-screaming-till-you’re-blue-in-the-face kind. But they’re loud and strong enough to make us a wee bit insane. They mostly happen when she doesn’t want to get in her carseat or have her diaper changed. Thanks to wise advice from lots of experienced parents, we are trying a variety of strategies, with some success, to head them off. But sometimes you have to have your diaper changed, whether you like it or not (and it turns out you do not like it—at all) and sometimes you don’t have the luxury of 30 minutes in which to leisurely decide to get your diaper changed. So there is screaming and kicking, and then eventually you have a clean diaper. Then suddenly, like a passing shower, you are back to your old sweet self, asking politely for a cup of water and saying thank you when you receive it. Thank God you’re so cute. Aside from the dramatic increase in demonstrations of fierce independence and willfulness, Zoe has had and been a lot of fun in recent weeks. During the last week in June we went to Deep Creek Lake in Western Maryland for vacation with friends, which was fabulous. Their daughter is nine months older than Zoe, and they’ve certainly played together before, but they were mostly playing next to each other. Now they’re actually friends! They spent hours on the screened porch serving each other and us tea and various pretend meals. Zoe likes everything to be flavored vanilla: tea, hot dogs, garlic, eggs, etc. I’m not sure why there are always large heads of pretend garlic in kids’ toys, but there are. Anyway, Zoe will accommodate with chocolate or strawberry on request. They also built a variety of structures with lego blocks, including houses, castles, cars, big-girl beds, cradles, and monsters. They played in the sand together and did remarkably well with the whole sharing thing. Zoe loves to collect rocks (she calls them treasures) and there were plenty at the beach to satisfy her. One moment that made us proud was when Nora wanted some rocks in her bucket just like Zoe had. Completely of her own volition, Zoe gathered a bunch of rocks and put them in Nora’s bucket and brought the bucket to her over on the towel where she was having a snack with her mom. Thanks to the calm waters of Deep Creek Lake, Zoe was totally excited to swim and not afraid of the water at all. She wore her life jacket (this is the trendy swim accessory for kids now—it’s a little cooler than the ones you would wear to go boating) and her fish swim ring (which she named Leslie) and eagerly ventured out with Randy and me. And then she decided to ditch Leslie and did a pretty close approximation of swimming and floating with us, laughing all the way. Although Zoe has napped in the same room as her friends at daycare for a long time, last week was the first time she shared a room with someone her age at bedtime. We weren’t sure how it would work but both sets of parents hoped it would. The first night we read stories together tucked our respective girls into their respective beds, sang a few songs, and crept upstairs. We listened in on the monitor, wondering what would happen next. “What did your Daddy sing to you?” … “My mommy doesn’t know that song.” … ”Does your Daddy know the words to “Amazing Grace?” … “What’s your doggie’s name?” …“My doggie is named Ralph. What’s your monkey’s name?” … ”What are the names of your dollies at home?” … (in unison) “TWINKLE TWINKLE LITTLE STAR…” “OLD MACDONALD HAD A FARM…” … “Zoe, what are you doing?” … “I don’t know!” and lots and lots of giggling. And eventually, from Nora, “Zoe, be quiet. It’s time to go to sleep!” Every night one parent or another would go down, usually at least twice, to encourage the girls to go to bed. Eventually they slept. We weren’t too upset. We were pretty happy and amused to listen to them chatter. Every morning began the same way. They would wake up and start talking and singing and wondering when we would come get them. 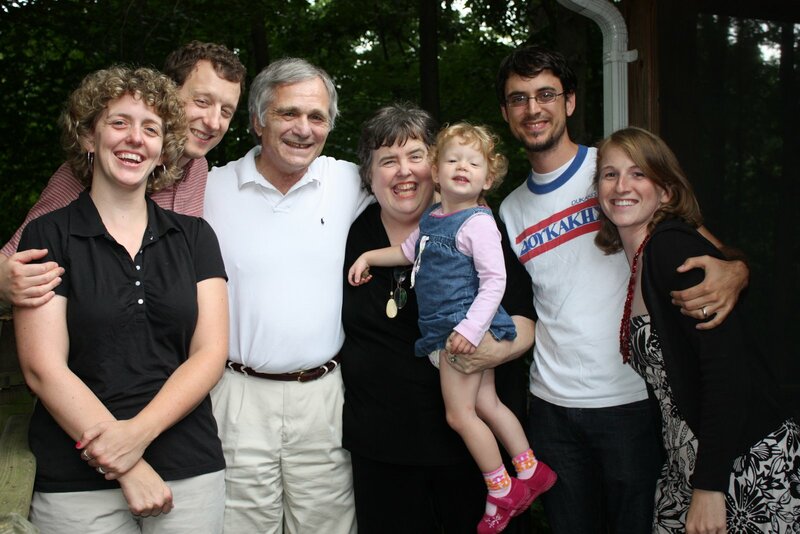 This past weekend we celebrated my parents’ 40th wedding anniversary, happily joined by my sister and brother-in-law who are in town for a few days on their cross-country sojourn preceding their move to Taiwan in the fall (Aaron’s going to teach for a year at National Hsinchu University). Zoe is delighted to hang out with Zannah and Uncle Aaron again. Sunday afternoon she was exploring my parents’ newly cleared out (from its previous overgrown to jungle proportions state) back yard. She found pine cones, rocks, sticks, and various creatures. She was wandering around under the supervision of Uncle Aaron and they made it to the front yard. I wondered what they were up to. When we were ready to leave we walked to the front and discovered that Aaron had been instructing Zoe in gardening techniques. Her clothes were soaking wet. I asked her what she had been doing. “I was playing with Uncle Aaron and spraying myself all over with the hose!” she exclaimed proudly. “Were you watering the plants?” I asked. “I was watering the plants too,” she said. Yesterday we celebrated my parents’ 40th wedding anniversary. My husband and daughter and my sister and her husband and I hung out with them on their porch, went out to my mom’s favorite Italian restaurant, played Taboo, ate strawberry shortcake, and took pictures. We gave them a book that we made (designed by my friend Annie) by soliciting stories and congratulatory wishes from my parents’ friends since childhood and various family members. We managed to keep a surprise, which was a real achievement. They were very excited about the book, which included some really funny stories I’d never heard before and some poignant essays by some of their best friends. My parents give me an excellent example of how to make a marriage good. Thanks, guys.